It was an early start to catch the 08:43 Virgin to get me to Wolverhampton for this match’s 12:15 kick-off I travelled in First and got water, a banana and tea to sustain me on the journey. At least the trains now seem to carry a lot of fruit, which is surely acceptable to all. 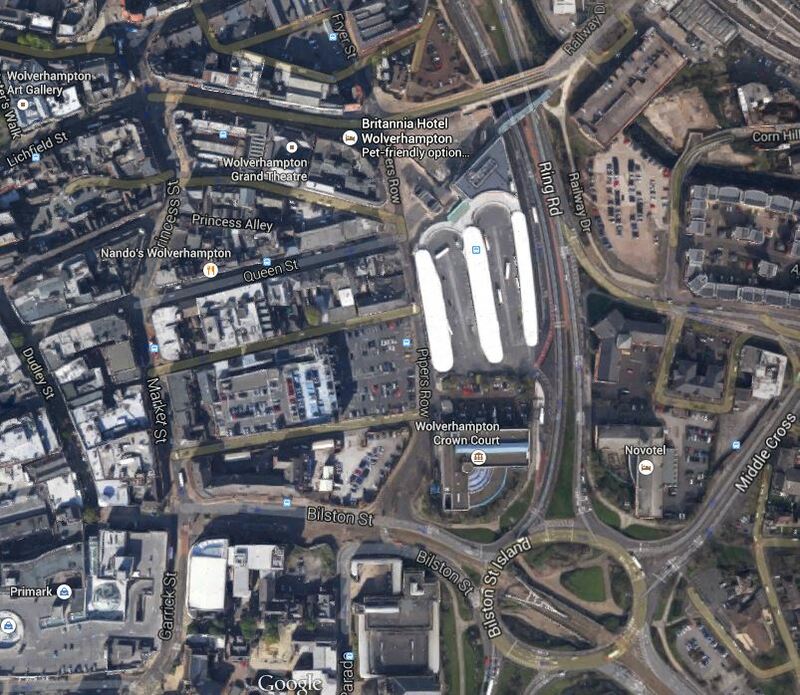 Molineux stadium is not that far to walk from Wolverhampton station, as the Google Earth image shows. I’m sure there must be a quicker way that is known to regular visitors, especially for Away supporters, who are in the top-right or north-east corner of the stadium. When I went to the ground today, I felt it would be prudent to have an early lunchtime snack, so I walked up into the city centre to the Marks and Spencer, to see if they had any sandwiches. Just as at Middlesbrough, there were none available. I then walked down from the city centre to the ground. Coming back, I asked the stewards and they said the best way was to walk through the buildings of the University and then climb up to the Inner Ring Road, which leads to the station. It wasn’t that difficult a walk, but I do wonder if a better direct route could be signposted that possibly ran along the canal in the area. 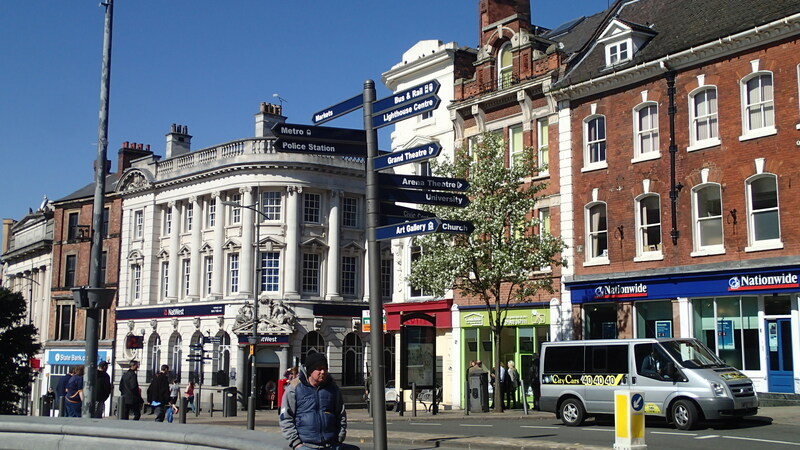 Wolverhampton does have signposts and liths, but like this one in the city centre, the football ground isn’t always indicated. Hopefully next time, I go, the Midland Metro will be connected to Birmingham New Street station, so it may be easier to go to Molineux by Birmingham and the Metro, as this will mean only a downhill walk in Wolverhampton and I could et in the larger city first. Coming back, it would probably be easier to use today’s route, until they extend the Metro with a loop in Wolverhampton. The Wikipedia section contains this statement. 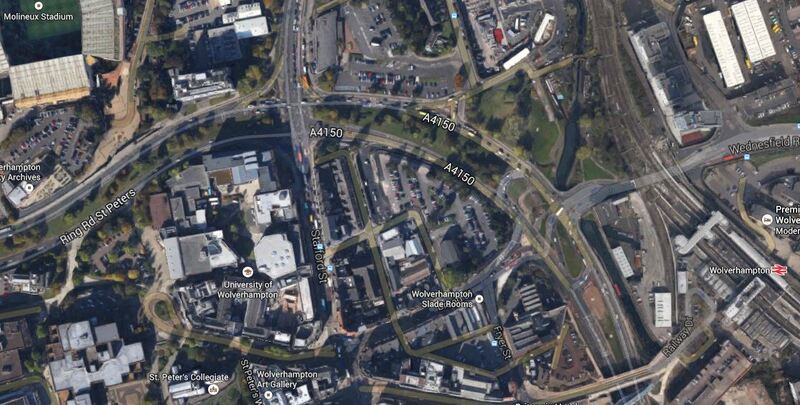 Surely as the football ground is next to the University, Wolverhampton probably needs a full city centre loop, that serves the shops, railway and bus stations, the University and the football ground. 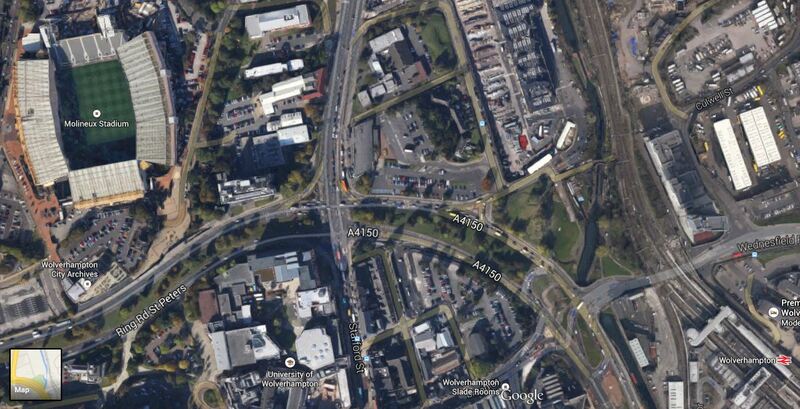 This Google Earth image shows the Inner Ring Road, the northern part of the city centre, the football ground and the train station. Note that the Inner Ring Road has a very wide central reservation, which must offer possibilities for running the Metro along the middle, serving the various stops by subway or footbridge. At the football ground there is already a subway and there is a bridge at the railway station, that could be upgraded to tram stops. This Google Earh image shows the bridges that connect the bus and railway stations. The big roundabout south of the bridges and the three limbs of the bus station is where the Metro enters Wolverhampton City Centre to terminate at Wolverhampton tram stop. Could not a branch turn north to serve the bus and train stations, Wolverhampton University and Molineux? In an ideal world, it would continue past the football ground to perhaps a Park and Ride site on the other side of the city. Or it could even go further round the Inner Ring Road and loop back into the City Centre to the existing terminus. There is also talk as in this article in the Wolverhampton Express and Star, of using tram-trains to extend the Midland Metro from Wolverhampton to Walsall on an old rail line. But then the West Midlands has used and disused rail lines everywhere and if tram-trains work well connecting Sheffield and Rotherham, I would think it is likely that proposals could be put forward to extend the Metro. The possibilities are endless and by 2020, engineers and civic planners will have come up with a scheme that is much better than any so far proposed. The football today was a hard-fought draw and a that was probably a fair result. The pictures show the ground, the match and the half-time entertainment.According to the report on the BBC web site, Mick McCarthy was forthright after the match. We are always hard to beat and hard to play against. The first thing I said to the players in the dressing room after the game was what a belligerent, stubborn, hard working, tough, horrible bunch you have turned out to be and I love you and I am proud of you because you need all those qualities to be a good team. It is lovely to have. I wouldn’t disagree with Mick’s superb motivational speech. You can imagine various military commanders saying something very similar.